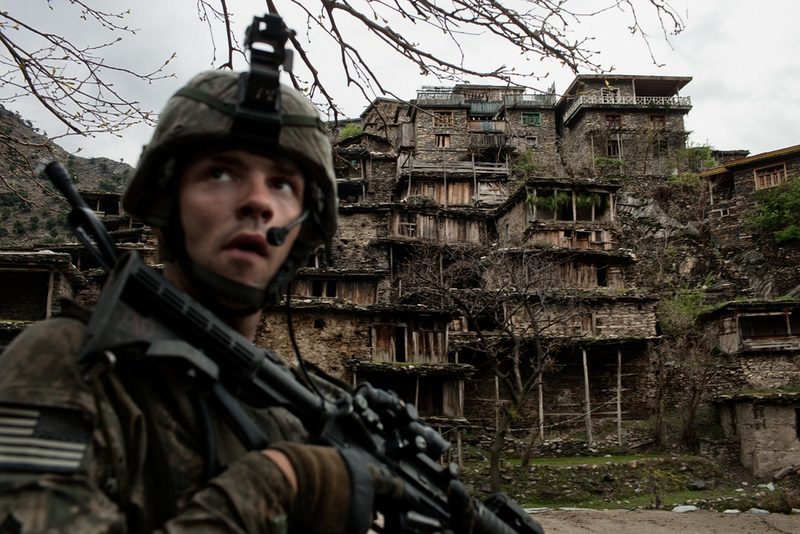 U.S. Army soldiers patrol through Loi Kolay village in the Korengal Valley, Kunar Province, Afghanistan. 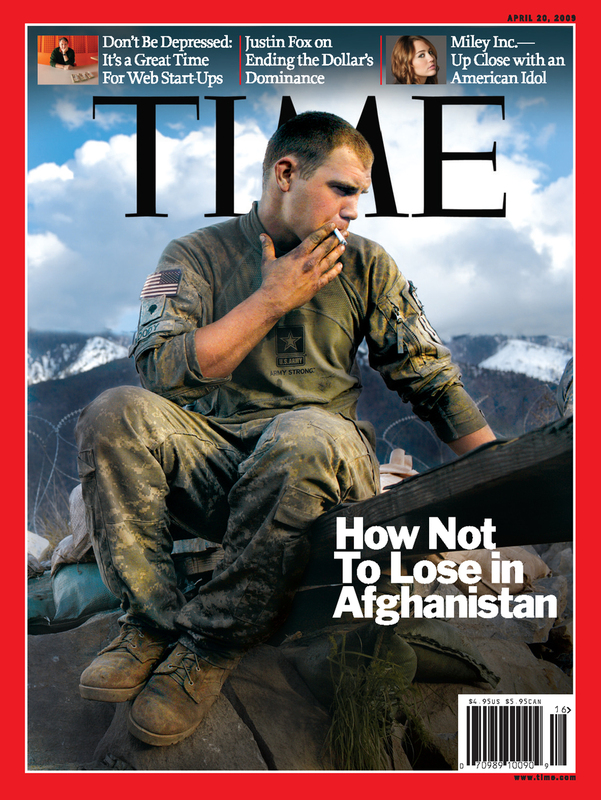 Smoke rises from a U.S. bomb that was dropped after a U.S. Army solider was killed in an improvised explosive device attack in the Korengal Valley, Kunar Province, Afghanistan. 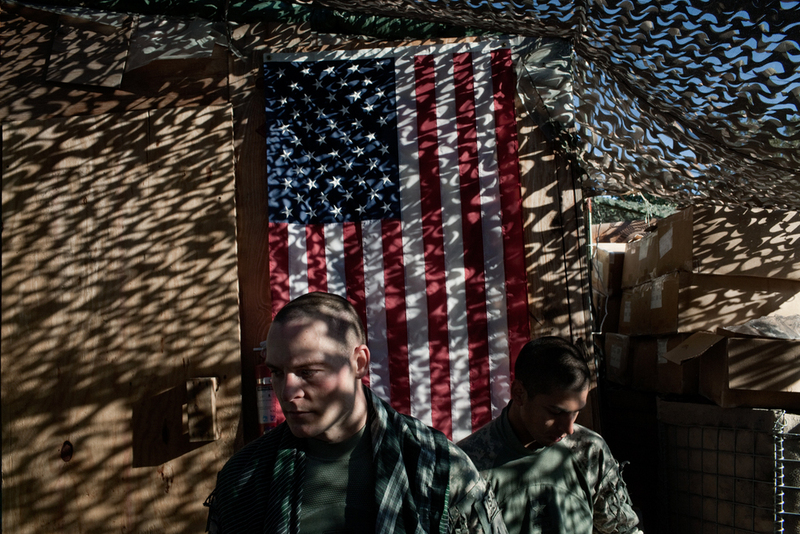 U.S. Army soldiers at Fire Base Restrepo in the Korengal Valley, Kunar Province, Afghanistan. Village elders attend a meeting with U.S. Army at the Korengal Outpost, Kunar Province, Afghanistan. U.S. Army soldiers fire mortars to support a patrol at the Korengal Outpost, Kunar Province, Afghanistan. Decorated clip on a U.S. Army M4 gun at the Korengal Outpost, Kunar Province, Afghanistan. An Afghan boy at a checkpoint in the Korengal Valley, Kunar Province, Afghanistan. U.S. Army soldiers patrol near Loi Kolay village in the Korengal Valley, Kunar Province, Afghanistan. An Afghan Army observation post near the Korengal Outpost, Kunar Province, Afghanistan. A U.S. Army sergeant sleeps at Observation Post Dallas in the Korengal Valley, Kunar Province, Afghanistan. A U.S. Army soldier works out at Observation Post Dallas in the Korengal Valley, Kunar Province, Afghanistan. U.S. Army soldiers patrol in the Korengal Valley, Kunar Province, Afghanistan. Smoke clouds from white phosphorous mortars fired by U.S. Army in the Korengal Valley, Kunar Province, Afghanistan. Village elders leave a meeting with U.S. Army soldiers after seeking compensation for battle damage and the release of a detained local, at the Korengal Outpost, Kunar Province, Afghanistan. A U.S. Army soldier takes cover during fighting with insurgents in the Korengal Valley, Kunar Province, Afghanistan. U.S. Army soldiers eat a meal prepared by Afghan labourers who work at Observation Post Dallas in the Korengal Valley, Kunar Province, Afghanistan. U.S. Army soldiers return to Fire Base Restrepo after fighting with insurgents in the Korengal Valley, Kunar Province, Afghanistan.